AUSTRALIA will send up to 50 police officers to Papua New Guinea by the end of the year to help tackle the country's growing law and order problem. Papua New Guineans will also enjoy "passenger lane" status - currently shared by Australian and New Zealand travellers - at Brisbane and Cairns airport from September. 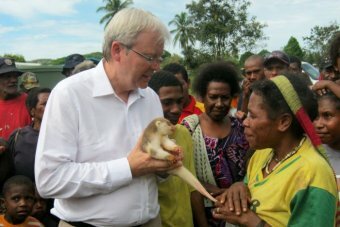 Australian Prime Minister Kevin Rudd on Monday announced the moves following talks with his PNG counterpart, Peter O'Neill, in Port Moresby. "Our law and order co-operation won't stop there, but it is a good start." The O'Neill government has also entered talks with Queensland for an exchange of up to 150 police officers, Mr O'Neill's office said on Monday. This separate program will aim to start with an exchange of 10 to 15 police. On-the-beat Australian police were turfed out of PNG in 2005 after the country's Supreme Court found the then Enhanced Cooperation Program (ECP) was unconstitutional. "This (current deal) is part of the joint agreement we signed with Prime Minister (Julia) Gillard," Mr O'Neill said. "This is certainly not part of the ECP program, which had some legal issues. "Both governments and officials are working to overcome those issues that are before us." Law and order has dominated news coverage of PNG in 2013 following a spate of grisly murders throughout the country. The most recent was the murder two weeks ago of four Chinese nationals near Port Moresby's busy CBD. Mr Rudd and Mr O'Neill have also agreed to ease travel to Australia for Papua New Guineans. The visa issue had been a sore point in relations, with Mr O'Neill telling Ms Gillard the arduous visa process was unfair. Now PNG travellers heading to Brisbane or Cairns - big business destinations for Pacific Islanders - will have an easier time getting into Australia. "These new arrangements will be rolled out from 1 September and will allow PNG citizens to use immigration processing lanes as holders of Australian and New Zealand passports do," Mr Rudd said.